Green manures have a lot in common with the other kind of GM crops (GMOs), though there are also some differences. Both green manures and GM crops produce pesticides in their plant cells, yet green manures are completely unregulated. Both are “unnatural” uses of crops, yet nobody argues about green manures. Conventional farmers use green manures, but unlike GM crops, so do organic farmers. 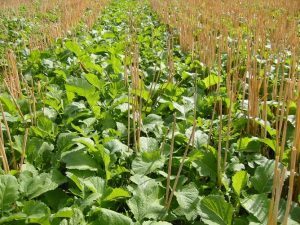 Green manures require tillage, but GM crops make no-till easier. Monsanto and other multinational seed companies do not produce GM green manure crops, but they should. 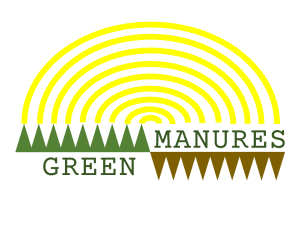 If brown manures are livestock-processed crop biomass, then green manures are their raw, unprocessed predecessors. A green manure is a cover crop that is tilled into the soil while still green. Unlike brown manures, the biomass is grown in place and is used in place with no transport costs. Growing a crop just to till it into the soil seems both generous and extravagant to me. Generous in that the crop is grown just for the soil. Extravagant that we are able to grow a crop just for the soil. The day may come when we cannot afford to displace food crop with green manures, but for now they are still an option. The time they take to grow in the field is perhaps the greatest cost of green manures. Farmers must fit them into their cash crop rotation. Here in the Columbia Basin of Washington, farmers often fill the entire growing season with cash crops, either single long-season crops like potatoes, or double crops like green peas followed by sweet corn. Only after wheat, or after early sweet corn, can they find a window for growing green manures. Mustard green manures are grown mostly after wheat here, planted in early to mid-August. The mustard then blooms in September providing valuable bee forage. A green manure crop being chopped and disked into the soil. Photo: A. McGuire. In mid- to late-October, the mustard crop is chopped and disked into the soil. This leaves the ground nearly bare, seemingly prone to wind erosion. However, we generally don’t see erosion on these fields. The tilled in plant biomass breaks down quickly, feeding the soil’s microbes, which produce compounds that bind soil particles together. The soil can then, at least in the short-term, resist movement from all but the strongest winds. It also improves infiltration for a while. Both effects usually last long enough to protect the soil until the cash crop’s canopy is established. Looking for soil movement in a mini-wind machine. 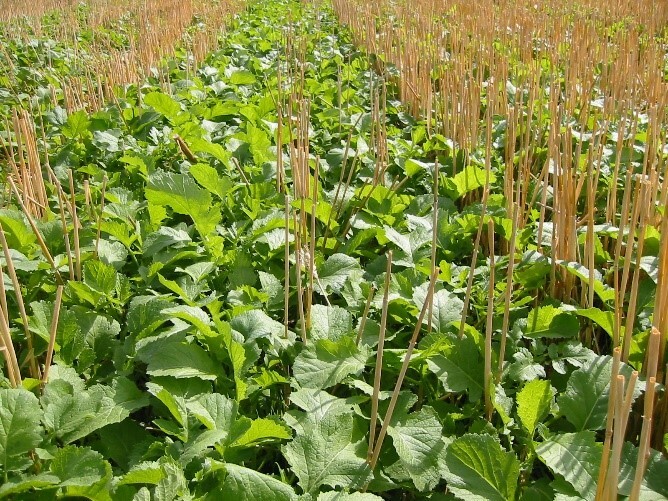 Mustard green manures were found to help the soil resist all but the strongest winds. Photo: A. McGuire. 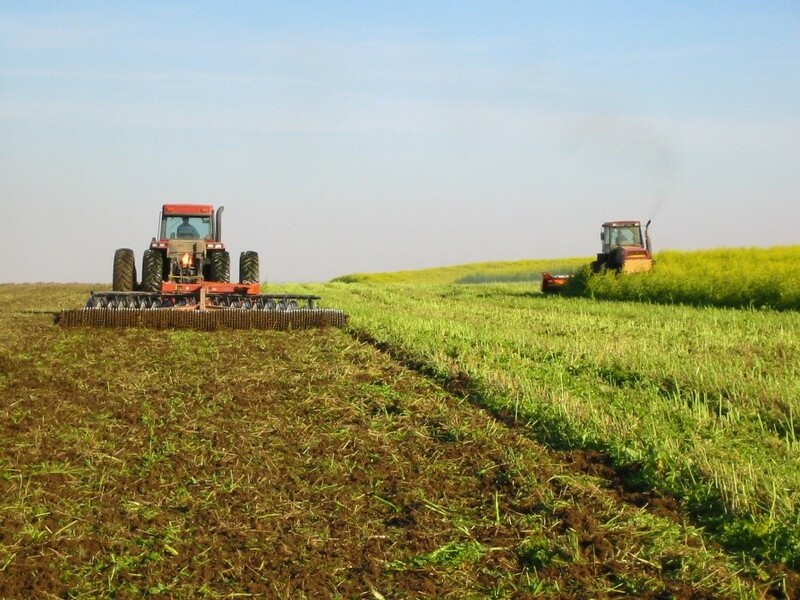 If there is good tillage for the soil, then it is found in tilling in a green manure crop, but only because the biomass added to the soil overcomes the damage caused by the tillage. In the Columbia Basin’s low organic matter soils, this added biomass can increase organic matter levels to 1.5 or even 2% over time. While this may not seem like much to a farmer in Iowa, it is 4 times greater than our native soils. This increase in soil organic matter is most evident where green manures are used most often. Because green manure biomass is the source of its benefits, non-legume green manures are often fertilized to produce the most biomass in the short growing window. This fertilizer is not lost, but is locked up in the decomposing organic matter and slowly becomes available to following cash crops. The combination of organic fertility from the green manure crop (even if it originally came from synthetic fertilizers) with the fertilizers applied to the cash crop, can be an efficient method of providing nutrients to crops. Like crop rotations, green manures are quite unnatural. Although I remember seeing someone propose green manures are similar in effect to landslides, that is going too far in trying to keep green manures “natural.” I suppose that hoof action by large animals such as bison would incorporate some green material into the soil, but this would pale in comparison with green manures in depth and degree of incorporation, as well as the quantity of biomass incorporated. Green manures are a good example of the bio-hacking that farmers do all the time. They take what nature provides – here the various green manure crops – and use them in a way that nature does not. They tweak, fine-tune, and mess with nature. 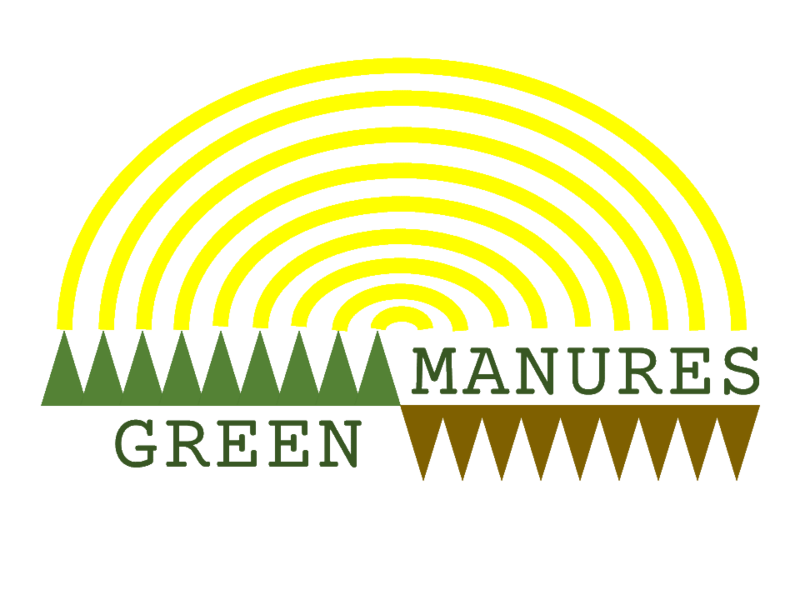 Because they are unnatural, green manures have unique effects. Soil organisms are adapted to breaking down plant roots and exudates. With green manures, microbes are suddenly inundated with large amounts of aboveground plant biomass; fresh, green, easily decomposed material with chemical properties different from plant roots. Could genetic engineering improve this GM crop? Photo: A. McGuire. Mustard green manure shoots, the leaves and stems, contain different organic chemicals from their roots. Researchers think these chemicals, called glucosinolates, may be behind some of the suppression of parasitic nematodes and fungal diseases that are seen after mustard green manures. 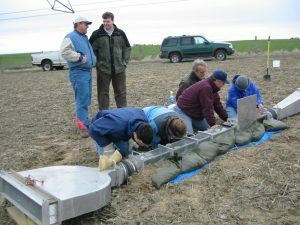 For this, and for the soil improvements, farmers in the Columbia Basin are using mustard green manures on an estimated 25-30,000 acres per year. Most of the mustard precedes potatoes, where the high value of potato production can cover the production costs of the green manures. This is where Monsanto or other seed companies could make some PR points, by using genetic engineering to improve green manures. If genetic engineers could tweak (bio-hack) the chemicals inside the mustard plants, either increasing their concentration, or producing more of the most effective glucosinolates (there are many versions of these chemicals), it might improve the efficacy and consistency of the mustard’s pest control benefits. It would also fit in with the potato industry’s recent focus on soil health, both local and nationally. Although the potato industry has had a tough time getting GM crops accepted by its customers – McDonald’s, Burger King, Wendy’s etc. – a GM green manure could be the GM crop everyone can get behind. One thought on "Green Manures, The Other GM crops"
Excellent information. Well written, good points, as always.